This is going to be a donation ask, but in my defense, I don’t talk about where I work that often, so let curiosity lead you to read on — Provide is the real deal. It’s really rare to be able to say that about a place, to see the sausage being made and still be able to say, no really, this place is legit. Provide works in Southern, conservative states to make abortion more accessible, specifically because they are challenging and because the culture is hard to move. We train health care and social service providers on how to refer to abortion care, often giving them some of the first accurate information on abortion they’ve ever encountered. This is a huge gap in their education — abortion is a basic healthcare need for women, nearly 1/3rd of women will have need of one in their life, but it is not treated that way for political reasons. A third of women need a service and that service is hidden behind closed doors and misinformation, even from people in health care roles. What Provide does is really different from what other abortion organizations do. The reason that I am so proud to work there is because it is situated so well at the intersection of so many concerns — class, race, gender, health, and geography — without making it about us versus them. We train people who are pro-life because our training isn’t about politics, and we have them acknowledge a professional obligation of care to their patients that is different from their own personal beliefs. 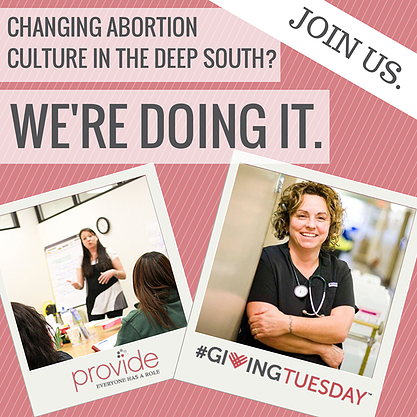 There is a place for abortion politics and there are a lot of great organizations that do that work, but we’re about on the ground culture change. And we’re actually making that happen. I am immensely proud to work for an organization that so successfully integrates intersectional feminism and harm reduction philosophy into its worldview, and I am immensely proud to work for an organization that cares about and invests resources in people who are from the South. Our trainers are people who were already local activists in the states where we work. My creative communications work means that I’ve gotten to put money into the local creative economy for video and acting and graphic design. We’ve got a UU church lady and an LGBT Youth Advocate; they didn’t hesitate to hire me despite my atheist activism and have never asked me to stop blogging and seeking attention on that front; we’re translating all our resources into Spanish and holding Spanish-language trainings. It’s really an amazing place. And it does it on a smaller budget than almost any other national abortion organization that you’ve ever heard of. This is the link to where we’re trying to raise $5000 today for‪ #‎GivingTuesday‬. This is the cost of one of our Abortion Referrals Trainings — a day long intensive training that teaches up to 40 health care or social service workers, at no cost to them, how to do non-judgmental, accurate referrals, why they should be doing them, and allows them to ask an actual abortion provider questions about what happens when they refer someone to an abortion. Here is a video featuring our field team from across our states that I spent about four months producing over the summer and I’m quite proud of it. If you have a minute (three minutes), check it out. And if you can donate, even a little bit, I know it’s not as aggressive a cause as atheism or politics, but it is a thing that is really making a difference in the world. And if you can’t, but think that what we do is worthwhile, maybe share what we’re doing, because a lot of people haven’t heard of us, and I think they should.